This new camera from Kodak, the V1273) was announced at CES 2008 in Jan. It just started showing up in stores, the past month or so. What intrigued me about the camera was primarily, it's ability to shoot HD video and wide format photos. 3 of the 5 TV's in our house are now 16:9 format and can deal with the various HD resolutions, so why not? 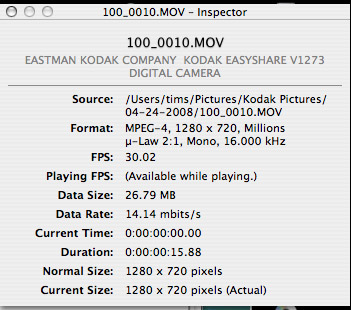 Also, if you're a Macintosh fan, this camera saves its video in Quicktime mpeg-4 format. This helps enable you to pull it right into iMovie, FCE and FCP or QuicktimePro very easily. While I can say I'm still a big fan of Canon Digital Elph cameras, this compact unit from Kodak and the forthcoming Panasonic Lumix FX500 have some serious features to consider. Touch screen LCD is cool, very similar to say, an iPod touch. I'm guessing it will burn through the battery quickly and it is a bit harder to see in sunlight. On the flip side, the camera is extremely simple, and super clean. Not many buttons at all! The "SMART" feature seems to do pretty well outdoors. Rapid fire (for kids sports) is limited to sequences of 3 still photos. (the SD850IS just keeps taking them, till the memory buffers, if you choose a lower megapixel setting whereas the V1273 gives you 3 photos and thats it. More time playing with the features will help. With 12 Mega Pixels and HD sizes thats a lot of data to push around. Mpeg-4 is also pretty taxing, from a hardware point of view so that might explain some of the sluggishness in the operation of the v1273. On a positive note, this is one of *THE FIRST* digicams that I've used in recent memory, that allows you freedom to zoom in/out while shooting video. Of course, holding this thing steady is extremely difficult, compared to a larger sized Mini-DV or HD Camcorder. I *really* like the wider angle lens on the SD850IS, and am looking forward to the debut of the new Panasonic Lumix with the 25mm-125mm effective focal length, Leica lens. Overall, not a bad entry at a $275 price point. You'll get some great shots and video from this thing in a small, clean package.